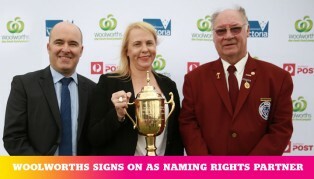 With less than three weeks to go before the running of the famous Stawell Gift, Australia’s largest supermarket retailer, Woolworths has jumped on board as the Naming Rights partner. The new partnership will breathe fresh life into the much-loved event, ensuring that it will be bigger and better than ever before. Stawell Athletic Club (SAC) president Trevor Skurrie said the partnership with Woolworths was fantastic news for the club, the rural town of Stawell and athletics, as it leads into the 134th running of the event. “It has been a difficult few months for the SAC as we faced the possibility of holding the event without a Naming Rights partner for the first time since the 1970s,” Mr Skurrie said. The 2015 Woolworths Stawell Gift takes place over the Easter long weekend from 3rd April – 6th April, with more than 10,000 spectators expected to attend the iconic athletics event in regional Victoria. “The Naming Rights partnership brings together one of Australia’s iconic businesses with the nation’s most iconic athletics event,” Mr Skurrie said. The Stawell Athletic Club has also secured other major partnerships with Carlton & United Breweries and Coca-Cola Amatil for the 2015 event, as well as the re-signing of Australia Post, State Government of Victoria and ASICS.